This is a bit of an odd page as it isn't about any one thing in particular, hence its rather ambiguous title. On it are a few of the things that I like or find inspiring and some of the places, music and literature that I love. For as long as I can remember I have had a passion for all things dark, romantic and strange. 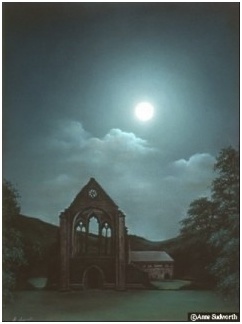 Even as a child, the eerie or otherworldly gained my immediate attention and amongst that which was gothic, I felt completely at home. My inspiration comes from many things - dreams, nature, mysticism, death, folklore and mythology. Night time too provides me with much of my inspiration and I have always been fascinated by moonlight. The dark has long been a haven for the imagination, where the unknown and the fantastic can become believable and where we can and often do, invent things that might or might not exist. I have always felt drawn to ancient places, especially old buildings and ruins - places that have seen many lives - or even deaths. Ruined castles, abbeys and churchyards never cease to fascinate me. Despite their dishevelled state they have a haunting beauty which is hard to define, few more so than Whitby Abbey. For all who have read Bram Stoker's "Dracula", Whitby Abbey will need no introduction. For those who have yet to visit it, I couldn't recommend it more strongly. I have been to the abbey many times and have always found it to be a most inspiring place. Its beauty is obvious to everyone but there's a wonderful sense of something else - something very powerful and majestic whilst at the same time, quiet and peaceful. For all its tranquility and peacefulness there's something very wild about it too and on a windy night it can be an exhilarating, if slightly unnerving place with the sea crashing against the cliffs and the gales howling about you. I've done a number of paintings of Whitby Abbey in various lights but I always feel it's at its most magical by moonlight. The first time I saw it, we walked round it in the late afternoon and I remember sitting and watching it and waiting for darkness to fall, long after most of the visitors had gone. There was a wild, cloudy sky and a gorgeous full moon. I did a number of very rough studies which resulted in my first painting of it. I've done other paintings of it since but this will always remain my favorite. 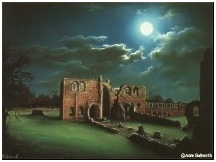 Furness Abbey is also a fabulous place though completely different to Whitby Abbey in every sense. Its warm sandstone walls give it a rosy glow which makes it look very strange in some lights - almost fairy-tale. It is set in a lovely valley, sometimes referred to as the Valley of Nightshade and is surrounded by ancient yew trees. It was built by Cistercian monks around 1100 and was added to in later centuries until its demise in 1537 with Henry VIII's dissolution of the monasteries. It's a huge place, so much of it remains it's hard to take it all in, one could spend hours exploring it. I have so far painted it twice though I expect I'll paint it again. Valle Crusis Abbey in Llangollen is one of the quietest abbeys I've visited. It was built in 1201 by the Prince of Powys. "Valle crusis" means valley of the cross and not far from it are the remains of the cross it was named after. It's certainly a very spiritual place and you can almost hear the Plain Chant as you wander round the ruins. Glastonbury Abbey is probably one of the most famous and is another very inspiring and beautiful place. It is actually in the centre of Glastonbury so it's not at all isolated as some of the others are and it always seems more serene, rather than wild. I'm about to start work on a painting of it which will hopefully be completed this year. One of the first castles I ever visited was Beaumaris Castle on the island of Anglesey, off the coast of Wales. It's a magnificent castle and is somewhere I used to visit a lot when I was a child. I haven't been there for a while but its presence has stayed with me and of all the castles I have visited I think it's one of the most memorable. So far I haven't done a painting of it but I'm sure I will do at some point. We recently discovered Old Wardour Castle in Wiltshire. Our wonderful friends, Gareth and Charlotte told us about it and we visited it with them last year. I was completely bowled over by it. It's a ruin in every sense of the word but what a magnificent and enchanting one with so much atmosphere and presence. I fell in love with it straight away and am hoping to paint it at some point this year. There are so many wonderful places it would be impossible to mention them all and I haven't even started on the churchyards. The smaller, quieter ones are usually the most beautiful, not quite ruined but perhaps rather neglected - where nature has taken over just a little bit and rambling briars and ivy have started to creep over the stones. We have some very lovely old churchyards near to us with some gorgeous head stones and monuments. They aren't particularly grand or impressive but they have a certain charm and presence and a wonderful haunting beauty which never fails to inspire me. Trees are very important to me and are certainly one of the most important parts of my work. I adore trees of any kind and in any season, they are all so wonderful. Our woodlands and forests are very precious and should be treasured. So many forests are dwindling and many great trees are being lost. It's incredibly sad and very worrying. But there are still some wonderful forests remaining, though not as vast as they once were. Savernake in Wiltshire is one of the most fabulous forests we have and it has a collection of some of the oldest trees in Europe and one of the best collections of 'monarch trees' in the British Isles. It is of course home to that wonderful tree, the Big Belly Oak, a truly formidable character who is more than a thousand years old. Many of the trees have names - the Cathedral Oak, the King of Limbs, the Queens Oak, the Duke's Vaunt - and there are many legends and old tales about these marvelous trees. It is said that if you dance naked round the Big Belly Oak twelve times, anti-clockwise at midnight, the devil will appear. Sherwood Forest is another of Britain's oldest forests and is home to the magnificent Major Oak, folklore says it sheltered Robin Hood and his men. Kirkland wood contains several hundred oaks which were among the twenty one thousand recorded in 1609. Delamere Forest in Cheshire is also a very special place and has some truly breathtaking trees and Alderly Edge, though hugely diminished, still has a number of beautiful trees. It was once part of an ancient wood and heathland. Legend says that King Arthur and his knights lie sleeping in a cave somewhere in the area. There is nothing quite like being deep in a forest, especially an old one. When you are surrounded by thick trees with a dense canopy above, it can feel rather strange and sometimes a little claustrophobic, often playing tricks on the mind. It's almost like entering another world. Forests can be quite dark places and some people find them a little intimidating and prefer to stay on the edge. But one doesn't need to go deep into a forest to find ancient trees, many stand alone in fields, hedgerows and churchyards. The Fortingall Yew in Perthshire is one of the oldest trees anywhere and stands in a quiet Scottish churchyard. It is said to have been growing before Stonehenge was built and was already three thousand years old when the Romans came to Britain. It's about five thousand years old but many believe it to be very much older than that. Some experts have suggested that nine thousand would be nearer the mark though this would be difficult to prove. Trees have great spiritual significance and have been considered sacred by many people, especially the Celts. There is so much lore and magic surrounding them and that lore and magic is intricately woven into the mythology of many of the ancient cultures around the world. In much of my work I use aspects of magical imagery and ancient beliefs and I like to explore the idea that the earth has a darker, lesser known side, perhaps one of which our ancestors were more aware. This is most evident in my 'Earth Light Trees''. It's one of the central themes running through my work and is an ongoing series of paintings which depicts trees, forests and woodlands glowing with their own 'earth light', a physical manifestation of a spiritual energy and life force. It's something that I'm continuing to explore. 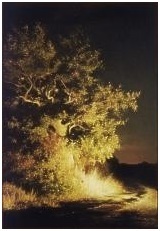 One of my earth light tree paintings. I have been interested in Stone Circle for a long time now. I was a very small child when I first came across them and they have inspired me ever since - and not just stone circles but burial chambers, cromlechs and other ancient sacred sites. Archaeology and history have always interested me so I find these ancient megaliths to be particularity fascinating in both of these areas. But the attraction goes much deeper than that - there is something about them that goes beyond the history and archaeology, beyond that which can be studied. They seem to be able to strike a chord deep within us and whatever one believes, one feels a certain strangeness, perhaps even reverence when walking round these ancient sites. I just love them, exploring them, painting them, being around them. The first circle I ever saw was Castlerigg Stone Circle near Keswick in Cumbria. It lies in the fells, away from our modern world, as such, it always seems very unspoilt and it has retained a very 'ancient' feel, if that makes sense. Since then I've visited many of the British stone circles and done several paintings of them. There are a number of wonderful circles in the Lake District including Long Meg and Her Daughters, a very large circle with Long Meg standing just on the edge. There are two enormous ash trees within the circle, though obviously not originally part of it but certainly adding to its beauty. It's a place of great tranquility, especially on a late summer evening. Avebury must be one of the most special places in Britain, it's one I've painted a number of times and will always be very special to me. It's a very strange place in so many ways and is completely unlike any other stone circle, not least because part of the village lies inside it. It is the largest stone circle in the world and is thought to be over four and a half thousand years old. But it is so much more than just a circle. There are many features that make up this ancient sacred landscape - Silbury Hill, the Avenue, the longbarrows, the Sanctuary and to the north of Avebury, Windmill Hill and other sites too numerous to mention. The stones themselves are wonderful and many have names. The Devil's Chair is the name given to one of the stones of the south entrance and is quite an extraordinary spot with a small seat in the stone. I don't think I have ever been to Avebury without sitting in it. Not far away is Stonehenge, I remember the first time I visited it, I was completely bowled over by its beauty, it's probably one of the most famous monuments in the world but never ceases to amaze. Wayland's Smithy is also a magical place, a Neolithic burial chamber in Oxfordshire, it has a very unusual atmosphere, quite unlike anywhere I have ever been. We have visited it several times at night and it has a most haunting feel - like Castlerigg, it's quite isolated which adds hugely to its atmosphere but it can be a rather unnerving place to be. There are so many ancient sites I've yet to visit and hopefully paint, I tend to keep going back to the ones I already know as I love them so much. I'm hoping to paint Thornborough quite soon and Swinside in Cumbria and then I may start to explore some of the ones I haven't yet seen. Along with trees, these ancient stones have become a very important part of my work. In some ways they are very similar and like the trees, they have a great deal of symbolism and spiritual significance. To me these ancient trees and stones are the silent watchers of our world, indeed I call them 'my silent watchers'. There is something dark and alluring about them, something quite magical and in a way, they have become a part of my own personal mythology, providing me with some of the most important elements which make up my work. 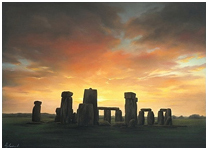 This is one of the many paintings of Stonehenge that I have done. I have to mention horses as they have always been such a big part of my life. I love all animals but horses are extraordinary and special in every way. They are some of the most wonderful creatures on this earth and to paint them is always a huge challenge - trying to capture their graceful, fluid lines, yet at the same time retaining their power and strength - it's a fine balance. I've ridden since I was five, though I don't have time to compete anymore. My own horse is a 16-2 hh chestnut thoroughbred. He was raced as a two year old and is exceedingly temperamental. He is also extremely handsome and incredibly fast. He's more like a dog than a horse, following me round and wanting to be the centre of attention. I've used him as a model in several paintings including "The Wizard" and "Edge of the world". 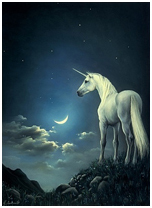 The unicorn in this painting is based on my own horse. I was brought up on Classical English Literature, especially Shakespeare - Richard III and Hamlet will always be favorites. I love Byron, Wordsworth and Coleridge, Sir Walter Scott, William Cowper, William Blake, Horace Walpole, Thomas Hardy, I always seem to prefer old literature rather than modern, though I do love Tolkien - if he can be considered modern. I collect old poetry books and I have some lovely early editions, It seems nicer somehow, reading the poems from books produced at the time. When I was growing up I spent a great deal of time in the English Lake District. With its rugged, untamed character and wild, changeable moods, I think it was that place more than any which prompted my interest in folklore and mythology, the tales of mystery, magic and the supernatural seemed to fit there so perfectly. I have always had a keen interest in British Mythology and anything Celtic particularly the old fairy tales. Many years ago I came across The Mabinogion, a fabulous book which brings together some of the earliest pieces of Welsh literature. It's a fascinating read as is The White Goddess by Robert Graves - a most wonderful study of historical, poetical myth.The ideas behind some of my paintings are influenced by Celtic myths and legends. The Celts had a great love of horses and trees, something I seem to have in common with them. ;It always surprises me when I meet someone who doesn't like music, not that I've met many. I listen to music so much of the time, especially when I'm working and I find it hard to imagine living without it. I like lots of different kinds of music, mostly Goth and Industrial and I listen to a lot of classical music. My favorite classical composer is Ralph Vaughn Williams - "Fantasia on a theme by Thomas Tallis" and "The Lark Ascending" are my favorites and I adore Allegri's "Miserere" and Mundy's "Vox Patris caelestis". I also love Elgar, Mozart, Delius, Chopin, John Dowland, Debussy, William Walton, Holst, Beethoven, almost all plain chant - very inspiring, Medieval and Elizabethan music, lots of opera, the list could go on. I almost always listen to music when I'm working, although it has to be a particular composer or band. There are hundreds of pieces that I love but could never work too. Music also helps me concentrate on my work and enables me to focus my mood.